Plot: A mother concerned about her young son's disturbing behavior thinks something supernatural may be affecting him. Starring: Taylor Schilling, Brittany Allen, Colm Feore, Jackson Robert Scott. 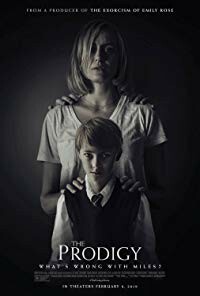 distributed by Orion Pictures «The Prodigy» in the US movie theaters released on February 8, 2019 and has grossed over $15 million worldwide; dvd and blu-ray release date was set for May 7, 2019. Rent from Netflix and Redbox from May 7, 2019. «The Prodigy» in the UK released in movie theaters on March 15, 2019. The movie estimated to release on dvd and blu-ray some time in June or July 2019.